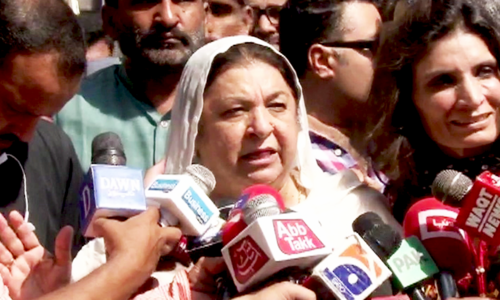 Chief Justice of Pakistan Mian Saqib Nisar on Saturday lauded Punjab Health Minister Dr Yasmeen Rashid's performance and advised her to not be fazed by criticism. Dr Rashid has been on the receiving end of severe criticism by the chief justice in recent weeks, first over the issue of Punjab Healthcare Commission's board and then on a lack of legislation regarding Pakistan Kidney and Liver Institute. The chief justice had expressed his disappointment with Dr Rashid's performance since taking charge, saying that he had a lot of expectations from her. However, in what seemed a departure from his evaluation of the minister's conduct, the chief justice today appreciated Dr Rashid when told by the minister that his recent remarks had led to the opposition demanding her resignation. "[We] will not let you resign; you should keep doing your work," the top judge said while addressing Dr Rashid during the hearing on private universities. "There is no need to be worried. You are very respectable. Your entire career has been stainless." Justice Nisar offered the minister advise from personal experience, saying: "Campaigns are run against us as well; there are such Whatsapp groups. Should we stop working in such a situation then?" "Your character is worthy of admiration and we do not have the words to appreciate with," the judge added. 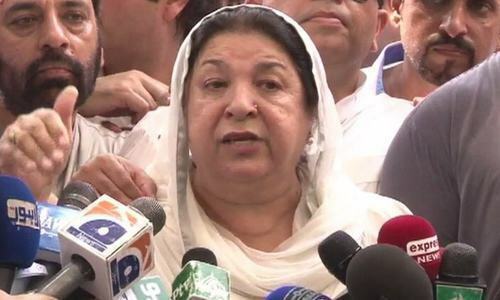 Be strong Dr Yasmeen Rashid and carry on your good work, let opposition shed their crocodile's tears as this is their strategy to gain unjust sympathies. The CJ is a gem of a person.His appreciation for Dr sahiba is deserving.He know the real fault line in our society and we hope that his successor will finally fix the fault line.He has laid the direction. Well done our honourable CJP. good should be appreciated & bad to be condemned. You will be remembered in our history & in the hearts of many like me. Positivity should continue & prosper in every mode & environment. Thanks to you our CJP. 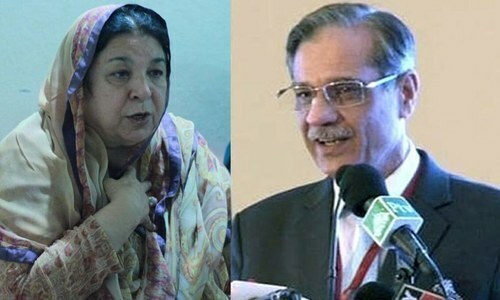 All hail to CJP and Dr. Yasmin Rashid, one of the few gems of Pakistan. Dr Yasmeen Rashid is one of the best minister of Imran's cabinet. She is hard working honest, sincere and true Patriotic. She has given her best abilities to the nation so far. Recently Zardari, Bilawal, Murad Ali Shah, and others have also become very respectable as well. Still, Glad CJPs farewell remarks though late are encouraging. Dr Yasmeen is widely respected in Lahore. The honorable CJP will be sorely missed. A gentalman with very high values. Words of wisdom everyone needs to stay determined and productive. Thanks CJ. I want asked Dr Yasmin Rashid. She always crying govt Pml N not provide the clean water,medicine and roads work lot of problems but I want ask only related.She arrange some medicine in hospitals and arrange the clean water in Lahore. Because always public face problem due to medicine and even chief Justice also warned.She start some Programme to better health for the public..
Hard working intelligent lady with educational background and expertise in the health field working as health minister, a right person for the right job. This is exactly a Canadian model. I strongly believe she will deliver. Take CJP criticism positively. Well done PTI. Thank you CJ and Dr.Yasmeen. People respect great people. Timely realized and timely U turn by CJP this is +ve sign. Appreciated CJP. Why is he getting into the middle of governance issues? Meanwhile the pileup of cases in the courts awaiting hearings is at an astronomical level. Wow! What prompted a 180 degree turn? A week ago Bibi was proving useless and today all of a sudden there are no words worthy enough to describe her stature! Mere fickle-mindedness or Dr Rashid suddenly invented a revolutionary treatment for Pakistan’s illnesses? Very nice... Do good for Pakistan and make Pakistan prosperous Dr yasmeen. Showing displeasur on non performance is necessary in any circumstances. But people know Dr.Rashid is very hard working we saw her effort during election compaign.She is very respectable women and I hope she will improve health sector in the Punjab. The CJ remarks pertain to her very appreciable. Dr. Yasmeen - great job - be vocal like CJ Nisar sahib. We need ministers who has the same vision and same energy that we see in our CJ.